Cambridge, UK (27 August 2013) â€“ According to CambridgeIP research, cited by the Wall Street Journal, Chinese based entities have now applied for more graphene patents than entities based elsewhere. In a feature article titled â€˜Wonder Material Ignites Scientific Gold Rushâ€™ Wall Street Journal science reporter Gautam Naik refers to research by CambridgeIP revealing there have now been over 9,200 graphene patents and patent applications made around the world â€“ up 19% from a year ago.Â â€œOver the past five years graphene patents have more than quintupledâ€ says the article, referring to CambridgeIP’s patent statistics. The article continued â€œChinese entities have filed for the most graphene-patent applications cumulativelyâ€.Â CambridgeIP is closely monitoring global graphene patent activity and commercialisation activities. Quentin Tannock (Chairman, CambridgeIP) is quoted in the WSJ article, saying that the global race for value from graphene will be â€œ…more of a marathon than a sprintâ€ and that some graphene patents may be filed speculatively or to frustrate competitors. According to Quentin â€œAssessment of simple numbers of graphene patents filed around the world does not tell the full commercialisation story. 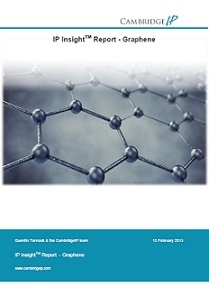 Close analysis is required to determine the quality of graphene patent filings and the viability of underlying researchâ€. IP LandscapeÂ® research from CambridgeIP provides evidence of a continued surge in interest in commercial applications of graphene technologies from corporations and research institutes around the world. Our IP Insight Reportâ„¢ â€˜Patenting flatland: Grapheneâ€™ addresses key questions, trends and features of the graphene IP LandscapeÂ®. Click to access the IP Insight report. As the first 2D crystal discovered and with unusual electronic, optical and mechanical properties, graphene is of interest across industry fields as diverse as Aerospace, Biotech, Energy, Industrial Chemicals and Semiconductors. Patents are central to business models and business strategies in many key application sectors for graphene developments. Since 2007 global patent filings around graphene have increased rapidly and the graphene patent landscape is fast developing. For enquiries about CambridgeIP please contact info@cambridgeip.com.